There will be four debates - two in English and two in French. One set, before Christmas in Vancouver and the second set in Central Canada after the holidays. Stephen Harper visits Quebec City and calls for an independent Director of Public Prosecutions. This office would handle investigations into political wrongdoings. Jason Kenney commits another bonehead move and calls a press conference to denounce Liberals as offensive to ethnic minorities. Apparently he can't tell the difference between a magazine and television station. If the Conservatives weren’t so twisted on booting the Liberals into space, they would think before issuing such releases. Departing Nova Scotia Premier John Hamm thinks the government should be offering tax credits to assist in the bedroom. A variation of this idea was floated by the PQ in Quebec last election and went over like a lead balloon. 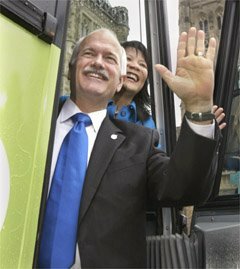 Jack Layton and party apparently have outsourced their post-secondary education policy to the Canadian Federation of Students. You think if you were going to outsource you would go a little higher up the food chain. Layton also played the Iraq war card. That was last election Jacko. Jean Chrétien just will not go away. Canada's first astronaut, Marc Garneau , is running as a Liberal candidate for Vaudreuil-Soulanges in Quebec. The RCMP is said to be investigating the income trust situation arising from the mini-budget. Gilles is chilling in Montreal until Tuesday. He is encouraging Quebec residents to vote Bloc and punish the Liberals. The Bloc is supposedly reaching out to all Quebeckers, but that seems a tad odd since their website is only in French. They should stop pretending that they care about the entire province and show their true colours. # posted by Shaky @ 7:01 p.m.
Marc Garneau used to be a great Canadian. Who chooses to run for the liberals, the Quebec liberals? # posted by Anonymous : 7:11 p.m.